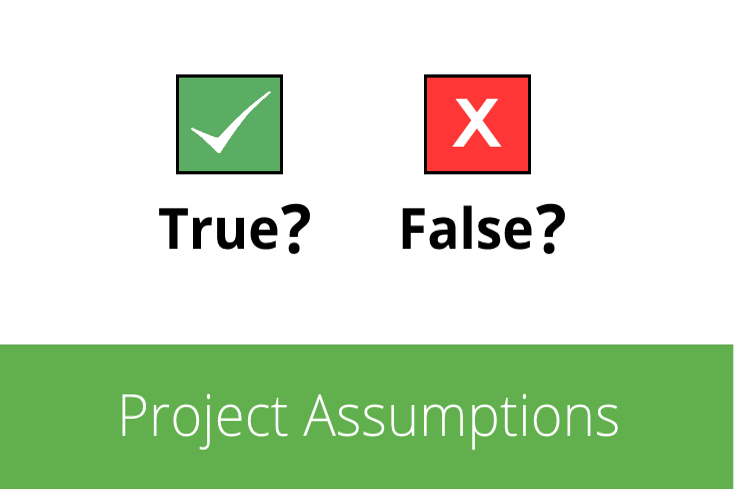 Assumptions are events that are expected to occur during a project’s life cycle, often without any proof. They are accepted as truths at the start of a project, though they can turn out to be false. In part 1 and part 2 of this series, we’ve covered the concepts dependencies and constraints. While there’s never complete certainty in project planning, which is why we can’t emphasize the importance of change and risk management enough, there are events and issues you can anticipate with a certain degree of certainty as a result of previous experiences. Which is why project managers have to make assumptions at the start of any project. An assumption is something that is believed to be true. It’s an event that you can expect to happen during a project. However, that certainty isn’t supported by factual proof, it comes from experience. Just like dependencies and constraints, assumptions are events that are outside of the project manager’s and team’s control. But unlike constraints, which put restrictions on a project and can pose a danger to its successful completion, assumptions open possibilities for it and make it possible for the project to finish successfully. This is how you can differentiate assumptions from constraints and dependencies. You need to make assumptions in a project to be able to move forward with it. As we’ve established, planning is never certain and there are many external factors you can’t control or anticipate. But you can’t just wait and delay the start of a project until you have all necessary information and certainty – because that will never happen. Making assumptions, documenting them and managing them is an important, but often overlooked part of project planning. Human resource availability: All key project team members are available and have the necessary skills and knowledge to work on the project. Budget availability: The determined budget is accurate and covers all project expenses. Scheduling accuracy: The set deadlines and milestones are achievable and the project can be finished on time. Performance of contractors, suppliers and vendors: All necessary equipment and goods are available whenever you need them. Upper management support: You have the support and buy-in from the C-Level and the project sponsor, who will back you up when issues arise. Its possible impact on the project. Write the key assumptions down in the project initiation document, along with the project dependencies and constraints. This will help you keep an overview of all aspects that might restrict your projects and also help you identify all the possibilities that enable you to deliver the project on schedule and on budget. Documenting assumptions also enables you to monitor and control them better. Assumptions are often true, but that doesn’t mean that they can’t turn out to be false during the course of the project. Remember, that assumptions are not facts. You need to constantly track and monitor assumptions. At one point or another in the project’s life cycle, you will be able to prove whether an assumption was true or false. Include the regular monitoring of assumptions in your project plan, e.g. schedule dates on which you will test whether your assumption was right or not. As assumptions are based on experiences, it’s vital that you review them at the end of the project. Which assumptions proved to be true and had the biggest impact on the project’s outcome? Which turned out to be false and had to be dismissed? Answering these questions will help you make more accurate assumptions in future project. A Guide to Dependencies, Constraints and Assumptions (Part 3): Project Assumptions - InLoox • Copyright 1999-2019 © InLoox, Inc. All rights reserved.